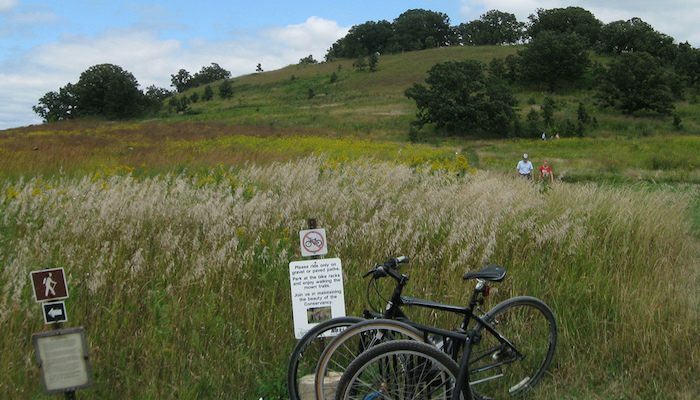 Pheasant Branch Conservancy, in Middleton on the west banks of Lake Mendota about 7 miles from downtown, offers a taste of the Wisconsin natural environment without forcing runners to stray too far from the city. The paths here are mostly springy wooden boardwalks over marshes and gravel trails through grassy prairies. The highlight is Frederick’s Hill, the mound in the north of the park, which looks back on stunning views of the city. Combined with the 3.3 mile main loop of the park, you can get in a great 4 mile workout ending in a superb view. Start at Fire Lot 4864 in the north of the park and turn right onto the main loop. When you reach the bike racks near Pheasant Branch Creek, turn right for the path to the summit of Frederick’s Hill. You can stop and enjoy the view here before returning on the single track path back to the main loop and parking lot.